One of my goals for the New Year is to post more slow cooker recipes on my site. I love my crockpot and use it all the time. I actually have several crockpots in different sizes and I use them all a lot. I think most of us enjoy the convenience of using a crockpot. We can put something in it early in the day and have dinner ready when we need it. This recipe is adapted from a recipe I found in Martha Stewart’s Everyday Food magazine. I was so glad to find a crockpot recipe in her magazine. I really wish they would publish more recipes for the crockpot. I think they would be popular because so many people are busy, but still want home cooked meals. I like this recipe because it was not only a crockpot meal, it was really easy to put together. You can really easily double or triple this recipe and use it for several days. You can serve this the first day as tacos with your regular taco toppings. Then the second or third day you can use the meat for burritos, enchiladas, or even in a mexican type soup recipe. It is so nice when I can make a recipe like this and use it for several days. 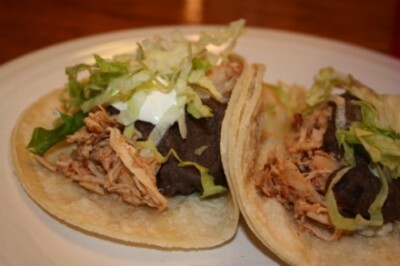 serve with beans, (I used my homemade refried beans) lettuce, shredded cheese,sour cream, etc. In slow cooker combine chicken, garlic, salsa, chilies, chili powder, 1 teaspoon salt, and teaspoon pepper. Cook on high, 4 hours or on low, 8 hours. Transfer chicken to a serving bowl, and shred, using two forks; moisten with cooking juices. Serve in taco shells, with toppings. This looks great! I’ve actually never had beans in my tacos. I guess I’ll have to try =D. Ah tacos. One of my favourite recipes to make. Brilliant! I have been looking for an excuse to buy those refried black beans at the local mexican grocery store! Here’s my chance. And I adore chiles in adobo so its nice to see them in a slow cooker recipe. Thanks for sharing…the recipe sounds wonderful. That looks like great comfort food for a chilly day! Those look nice and light. Mmm. Too funny–after making some slow cooker chicken enchilada chili last week, I had the same thought: I need to do this more often!! It’s so nice coming home to a hot meal-perfect for working women. These tacos sound so wonderful! That looks great! I am always looking for more things to do in the slow cooker. Love crockpot recipes and this is right up my hubs alley! wonderful recipe, thanks a bunch! This looks great – I’m going to make it this weekend when our neighbours come over for dinner!